With Art In The Streets, Jeffery Deitch opened his reign at Los Angeles' Museum of Contemporary Art with a bang. The exhibition, drawing historic material and fresh installations from the world's most renowned graffiti artists, certainly set a tone. In 2011, street art was impossible to ignore. Museum's across the Nation followed Deitch's plan, and artist's like Swoon and KAWS became regular names on institutional planning lists. 2011 also saw the artist as social activist rise again, most notably in the figures of Ai Weiwei and JR. The artists that held our attention in 2011 were those that stayed busy. They wowed us with gallery exhibitions and museum installations. They kept our eyes through savvy commercial work and even produced some of the best album covers of the year. In all, picking just 25 people is a daunting task, but make one thing clear, these were the people we talked about the most. 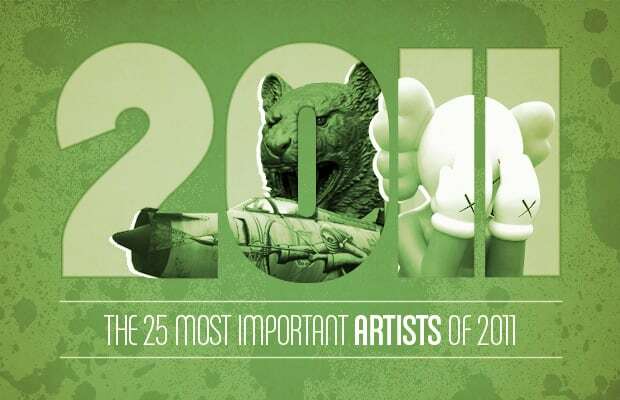 The 25 Most Important Artists of 2011.